A motivational speaker for the bees! Monday evening we attended the home of motivational speaker Chris Moon to deliver one bespoke Plan Bee hive. Chris is, put simply, an incredible human being, after losing his lower right arm and leg in a landmine explosion he has used his skills as a previous army officer and humanitarian to motivate and inspire those around him. With a ‘passion for the process of achievement’ as he puts it, everything Chris does challenges the concept of limitation and through this partnership we certainly are one step closer to achieving our goal of helping bees overcome the challenges they face in the modern world. Chris’ beehive will have an incredible impact to their surrounding environment and Scotland’s biodiversity within days as well as working hard to produce honey completely unique to the area they forage in. 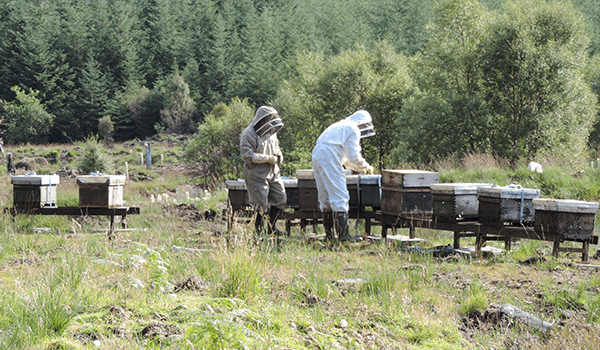 Glencoe Wood now has beehives! Over the weekend we delivered some brand new bee hives to the Highland Titles Nature Reserve in Glencoe Wood and wow what a treat! The ten bee colonies will have plenty of foraging ground and a wide variety of different flowers and heather to snack on. We are incredibly excited to share their progress with three of the reserves neighbouring schools to help the pupils understand the importance of the honey bee within our environment. Not only were Stewart and the rest of the staff incredibly enthusiastic about their new additions but the scenery was absolutely breath taking, made all the better by the lovely, albeit rare Scottish sunshine. We are honoured to partner up with the reserve through this project, working incredibly hard to protect Scottish wildlife- which you can watch via the reserves infra-red motion sensitive cameras- Glencoe Wood makes an incredible contribution to Scotland’s biodiversity. Highland Titles is a novel way of managing a conservation project, originally conceived by Dr Peter and Laura Bevis, a biologist and accountant, who realised that to really make a difference, they needed to buy land which had the potential to be restored and conserved. The organisation has grown from there and now has thousands of supporters turned land owners around the world. Highland Titles are completely committed to Scottish conservation and in this respect they are not alone, here at Plan Bee we love when any company wants to make a positive contribution to the environment but when we work with companies who are committed to Scotland’s biodiversity as Highland Titles it is always a pleasure. We cannot wait to see the hives thrive and pay another visit to this wonderful Scottish setting! 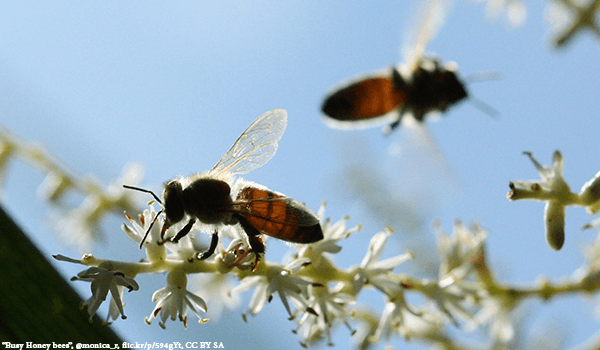 When did bees last send you an invoice for pollination? 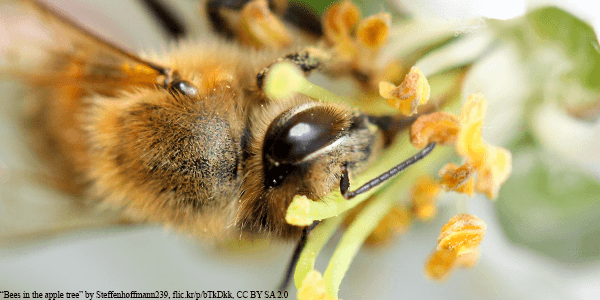 It’s the end of the month and you’re sitting down to pay your bills, electricity- paid, gas- paid, TV- paid but, have you ever thought about how much you owe the humble honey bee? Yes, these iconic insects not only enhance their surrounding environment but they also have an input into around a third of all our foodstuffs through their pollination efforts, contributing over £400 million a year to the agricultural industry, all whilst producing delicious honey and bees wax. 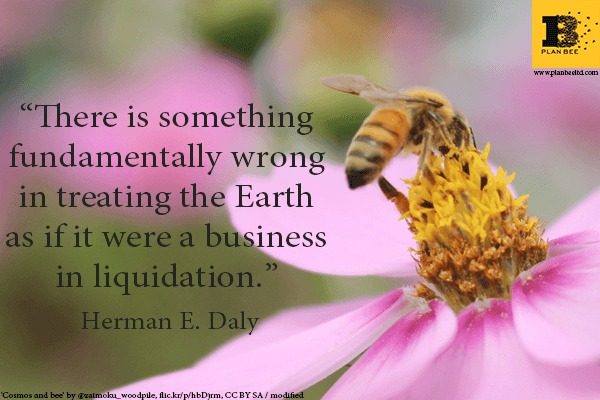 And while the European Union values insect pollination at £134 billion (153bn Euros) it misses the point that pollination is priceless; to say that every company, city, family and person is 100% dependent on nature and the biosphere is both indisputable as well as banal. Despite our dependence on these little creatures, bees worldwide are disappearing at an alarming rate due to habitat loss often attributed to the use of pesticides by the very farmers who rely on bees for their survival. 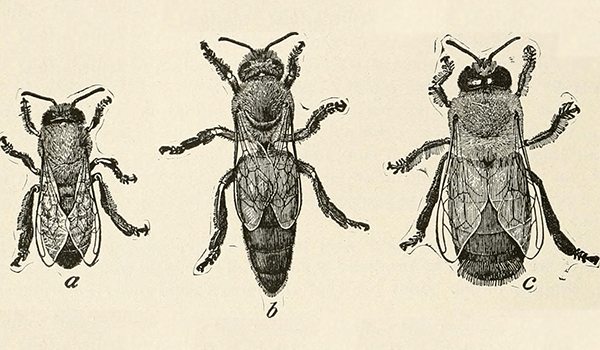 When we consider how intricate the eco-system is, the value of bees and other insects is obvious. 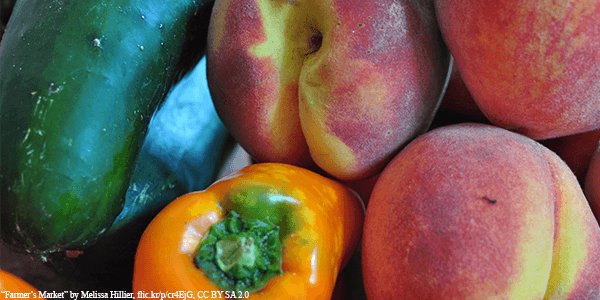 Not only are they pollinating much of the food that we eat, they are also ensuring the future generations of all kinds of plants that support many other species. For this reason reducing emissions and recycling is not enough, we must positively contribute to the ecosystem and attempt to help our bees cope with modern life. The expense of low bee hive activity has already been seen in countries like China where crops are having to be hand pollinated just to yield a harvest and the plight of the honey bee is regularly seen in our news headlines. For now pollination is free in the West but if the bee does die out there will be much bigger costs to pay than missing your monthly phone bill. How many of you know how honey is made? While we all enjoy the tasty results of the honey bee’s hard work, how many of us actually know how honey is made? Well fear not because the wiz kids here at Plan Bee can explain all. First of all it’s important to understand that different bees have different jobs, there are the various worker bees who feed the larvae or go out ‘scouting’, looking for flowers and collecting nectar – a sugary liquid used to make the honey- as well as the drone bees who mate with the Queen whose purpose it is to lay eggs and raise hive morale. When a forager bee sources a flower they will drink the nectar using the extremely long tongue and store it in their ‘crop’ or specialist honey stomach, when they have drunk their fill they will fly back to the hive and pass their loot on to a ‘processor’ bee at or near the entrance of the hive before heading back out to source more nectar. 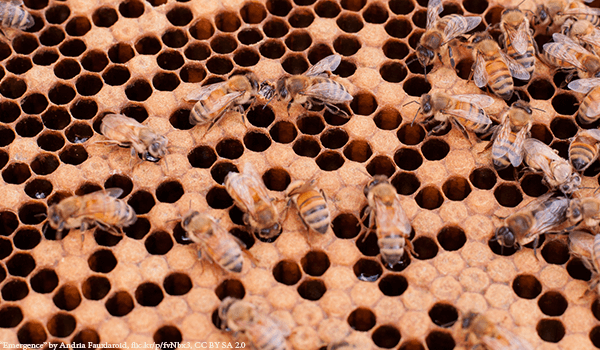 The processor bee then transports the nectar to the honeycomb, where it transfers it into the hexagonal wax cells. Here the processor bee adds an enzyme called ‘invertase’ to the nectar in the cell and the nectar consisting mainly of sugar and water – or for you science boffins out there, sucrose- is broken down by the invertase into glucose and fructose. A small amount of the glucose is attacked by a second enzyme, glucose oxidase, and converted into gluconic acid and hydrogen peroxide. The gluconic acid makes honey an acid medium with a low pH level that is inhospitable to bacteria, while the hydrogen peroxide gives short-range protection against these same organisms when the honey is ripening or diluted for larval food. The bees then ‘dry out’ this sticky mixture by fanning their wings to evaporate any moisture within the honeycomb. 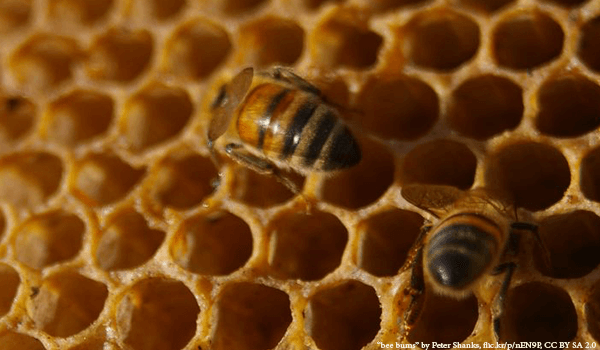 When the nectar has ripened into honey it contains so little water than microbes cannot grow in it, which is the reason why honey is practically immune to funghi and bacteria, however this only applies when the honey is sealed, which the bees do at this point by capping the honeycomb. It is at this stage where bee keepers know that the honey is ripe and ready to be harvested where it is then jarred and delivered to the breakfast plates of millions of people worldwide. 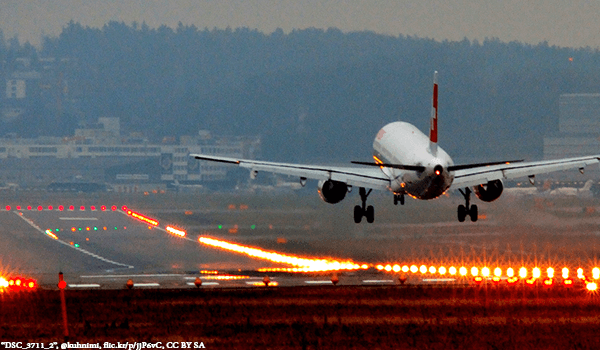 Hamburg Airport now has even more air traffic, in the form of its very own resident honey bees! The hives, managed on behalf of aviation giant Airbus, produce honey which is then used to measure emission levels around the airport grounds. The collected honey provides information regarding any chemical or metal deposits in the area allowing the airport to constantly monitor its environmental impact. The honey is then taken home by Airbus employees and clients to enjoy! 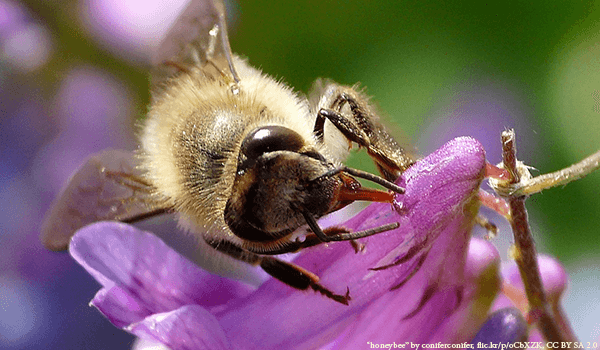 Honey bees and other pollinators are one of the most important species within our eco-system, in addition to influencing over a third of our food produce they are also absolutely crucial for the survival of most of our animal and plant populations. 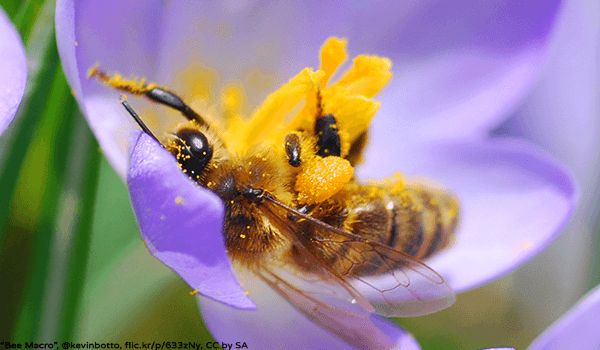 While all insect pollinators are incredibly industrious, perhaps the humble bee is the hardest worker of all. In addition to pollinating hundreds of thousands of flowers in a lifetime and contributing to the beauty of our countryside and urban jungles alike, they also work exceedingly hard to produce delicious honey. 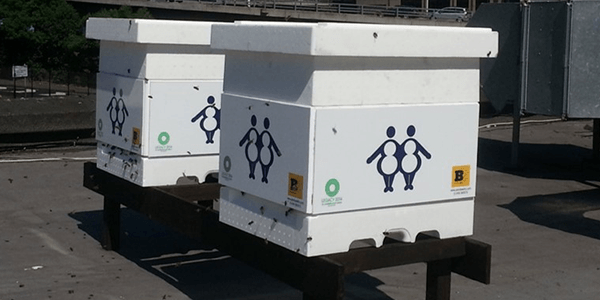 By introducing bee hives, airports can now easily monitor their emissions and overall carbon footprint, allowing them to assess their environmental impact whilst making a positive contribution to their surrounding biodiversity. 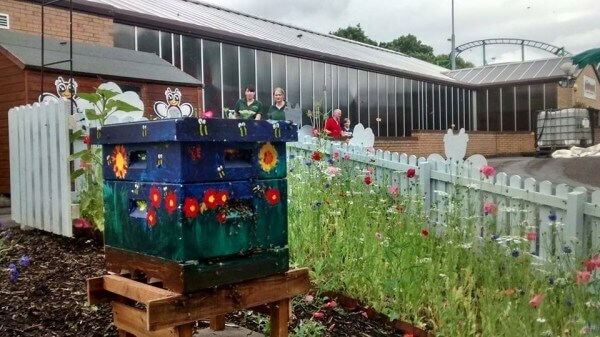 Whilst it may be surprising to some, modern airports thoroughly understand the importance of ethically managing their environmental and social impact and by housing bee hives on site the airports in question are going one step further in showing their customers how much they care, whilst creating a wonderful opportunity for customer and community interaction. Some organisations have even implemented the use of small cameras within the bee hives, allowing customers and staff alike to watch with growing interest the bees organised comings and goings, creating a unique point of interest and calm in an otherwise stressful environment. As the Hamburg hives have shown, the collected honey proves an incredible source of natural data regarding the airports carbon emissions and air pollution allowing them to adjust their actions accordingly and ultimately help improve their surrounding environment and biodiversity in a natural sustainable way. Such a commitment to the environment is something that we here at Plan Bee would certainly love to see from our own airports here in the UK and we would be delighted to provide our services to help them increase their own sustainability whilst making a positive impact to the environment. 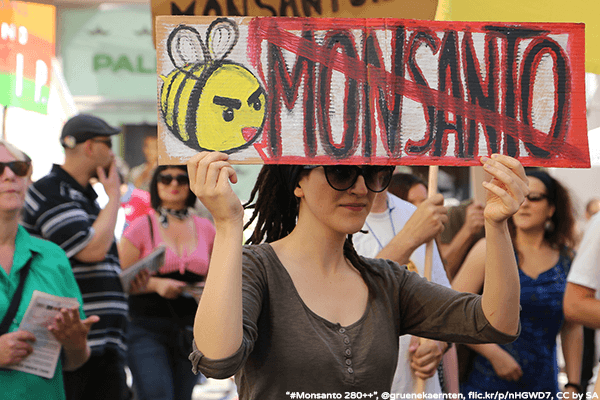 A group of Mexican bee-keepers have won their fight against bio-tech giant Monsanto. The company’s plans to plant over 625,000 acres of genetically modified soy-beans were thwarted by a Judge convinced by the arguments of thousands of Mayan farmers and bee-keepers backed up by the likes of Greenpeace and various ecological bodies. The decision, made on the basis that Monsanto modify their crops to be resistant to glyphosate, an active ingredient in many pesticides found to be potentially harmful to humans as well as crops and wildlife, means that the agricultural giant is no longer able to go ahead with its multi-million dollar plans. With over 25,000 Mayan families being involved in the honey industry, the court judged that co-existence between bee colonies and GM crops was not possible and with Mexico relying heavily on the exportation of honey products, (in 2011 the EU imported £32 million worth of Mexican honey) and the EU and other parts of the world having strict no GMO rules the decision to produce genetically modified crops on such a mass scale could have devastating effects on the economies of countries who choose to do so. 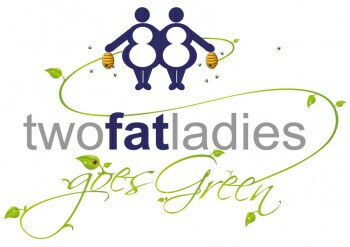 Two Fat Ladies Goes Green! 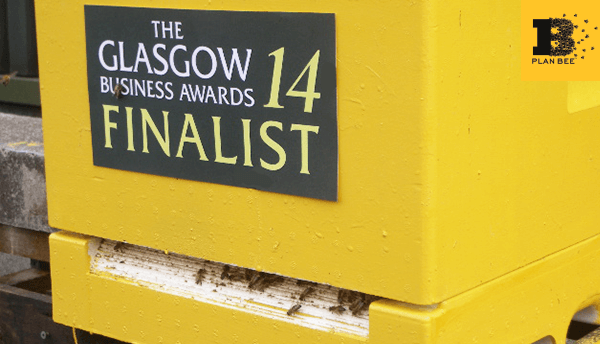 Two Fat Ladies has received a nomination in the Glasgow Business Awards 2014 for the ‘Green Champion’ category for their various efforts in becoming a more sustainable business, including their two bee hives on site managed by the Plan Bee Company. Since adopting two beehives from Plan Bee in 2013, Two Fat Ladies Group have been able to align their corporate social sustainability with their brand values in order to validate efforts in sustainability that are core to the company. They have also been able to make a natural positive impact on their surrounding community, making them stand out against competitors and offer customers something unique in their dining experience. Being visionaries that see the strong potential in the concept of managed beehives, the Two Fat Ladies realise the importance of bees in our planetary food system and are actively helping to regenerate their populations through supporting Plan Bee and their efforts. In the future, the Two Fat Ladies Group will keep supporting the regeneration of honeybees in the UK by continuing their relationship with Plan Bee Ltd. They will also encourage further engagement with their local community by getting a nearby primary school to be involved in designing a label for the next yield of honey to be taken from the hives. Buzz-iness Awards! Plan Bee Ltd have been nominated for the prestigious ‘Excellence in Communications’ and ‘Best Performing Business (1-10 people)’ categories in the Glasgow Business Awards 2014 at the Hilton Glasgow Hotel in October. It’s been a busy year for the Plan Bee team. Since scoring 175% over-funding with a highly successful crowdfunding campaign the award nominations have kept on coming. As well as Glasgow Business Awards recognition, Plan Bee’s efforts are also being recognised by the Inspiring City Awards – People Make Glasgow, where they are a finalist in the Environmental Category, and in the VIBES Awards where again they are nominated in two categories, for ‘Micro-business Award’ and ‘Environmental Product or Service Award’. 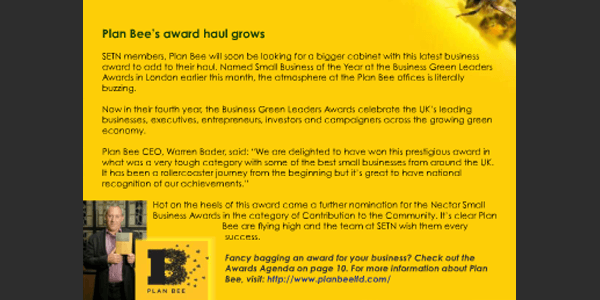 Plan Bee has already scooped the ‘Social Enterprise’ award at the Private Business Awards Scotland and will feature at the National Awards; and there was the Business Green Leaders Awards where they collected the gong for ‘Small Business of the Year’. Bee venom has been confirmed as a potential cure for cancer this week. The results of previous research by scientists around the world have shown bee, snake and scorpion venom to have remarkable effects on cancer cells but now research by the American Chemical Society has devised a way of introducing the powerful proteins found in insect stings and reptile venom to malignant cells without damaging healthy ones. Venom from bees, snakes and scorpions contain peptides which adhere to cancer cells, potentially preventing any further growth or spread of the disease and whilst merely injecting a patient with such venoms could have harmful side effects, scientists have now found a solution. “We have safely used venom toxins in tiny nanometer-sized particles to treat breast cancer and melanoma cells in the laboratory,” says Dipanjan Pan, Ph.D., who led the study. He says that in the honeybee study, his team identified a substance in the venom called melittin which keeps cancer cells from multiplying. And whilst bees make so little venom that it would not be feasible to extract it in mass quantities, the scientists have managed to recreate synthesized melittin in the lab. Dr Pan added that whilst tests were currently at a laboratory level it was expected that a patient trial would be possible in the next three to five years. A huge thank you to SETN (Scottish Environmental Technology Network) for featuring us in their company magazine this month. Discussing our already impressive array of awards they showcased our most recent accolade, ‘Small Business of the Year’ which we were awarded at the Business Green Leaders Awards in London earlier this month. The Business Green Leaders Awards celebrates the top innovators in the eco-industry and we were honoured to have our efforts in improving the UK’s biodiversity recognised, winning awards like this one is incredibly important to the team here at Plan Bee and as SETN suggested we may even have to buy a bigger awards cabinet soon…..
What comes to mind when you think of your local golf course? Do you picture a tranquil landscape of sporting promise? Or a green desert, providing nothing but dead wasteland requiring masses of chemical interference to maintain its manicured façade? Here at Plan Bee we see golf courses as so much more. Already providing acres of greenery, with just a few minor changes, golf courses across the UK could become a safe haven for our many forms of plant and wild life. 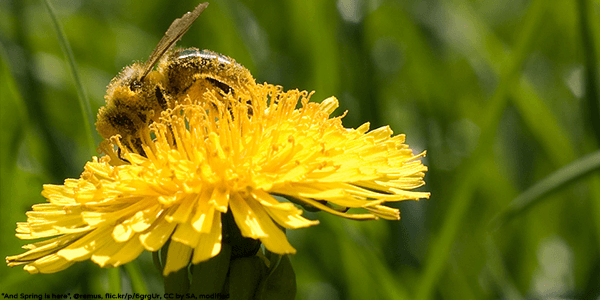 By introducing native flowers and plants in out of play areas, golf courses can provide a ready-made habitat for bees, other pollinators and many other forms of wildlife. With bees being one of the most important creatures in our eco-system, not introducing a hive to your golf course at this point would be a wasted opportunity and your golf course could reap the benefit of its new hive within days. With the new ‘eco-machine’ in place it is absolutely crucial not to ruin all of the new resident bees’ hard work by continuing the use of pesticides and herbicides, which reduce both the diversity of the foraging available, as well as the wildlife. 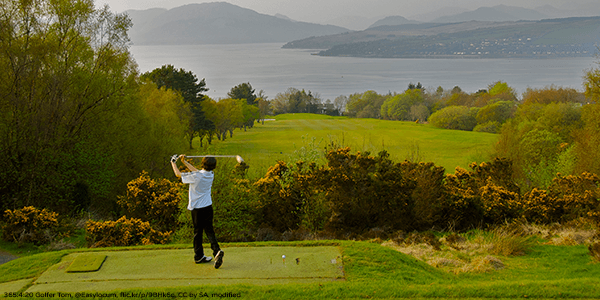 As well as helping to enhance Scotland’s biodiversity and improving their own sustainability, UK golf courses open up many exciting business opportunities through the introduction of hives. Inviting local schools or organisations along to monitor the hives’ progress can showcase golf clubs as active community members while of course opening up the possibility of golf memberships to a much wider audience. While improving their social responsibility, the hives will also produce honey, which can be used either in food preparation at the club or sold to members and staff to take home! Hives offer many benefits to the landscape that they live in as well as many low cost business revenue opportunities to get golf courses buzzing! 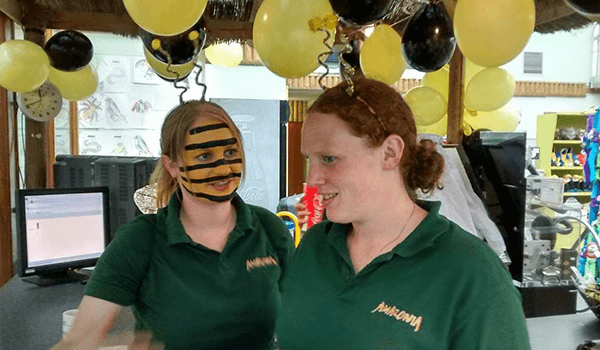 Plan Bee went to Amazonia (M&D’S Theme Park) last Sunday to participate in a bee themed family fun day! 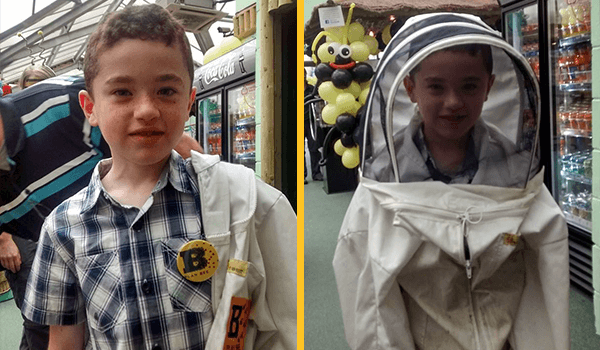 With plenty of bee themed activities on offer, including face painting, balloon modelling, flower planting and honey tasting we felt right at home. As well as showing off the brand new bee hive at Amazonia, Plan Bee discussed the importance of pollinators with the kids, probably convincing more than a few to be future bee-keepers! 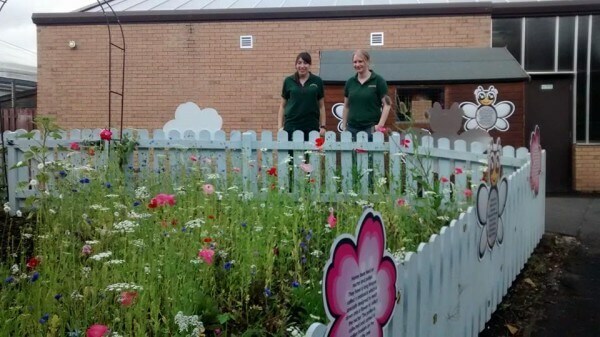 We really enjoyed speaking to everyone about all that bees do for us in our environment and would like to thank the very friendly staff at Amazonia, you made our day! Short-listed at the VIBES Awards 2014! We are very proud to announce that Plan Bee Ltd have been short-listed in two categories at the VIBES Awards 2014 (Vision in Business for the Environment of Scotland)! The VIBES Awards are held each year to recognise and showcase best environmental practices. The two categories are Environmental Product or Service Award which rewards businesses that have developed or are developing a technology, product or service that brings environmental and business benefits and Micro Business Award. The VIBES Award Ceremony will be taking place on the 27th of November in the Grand Central Hotel, Glasgow. Let the bees get to work at Amazonia! Last April, the Plan Bee team went to Amazonia, Scotland’s Largest Indoor Tropical Forest, to give lessons about bee-keeping and the importance of honey-bees and other pollinators within our eco-system. As well as this unique learning experience, the kids had the amazing opportunity to paint the beehive that Amazonia was going to place in the park! With the decoration of the beehive complete, the team at Amazonia had to get to work in creating the perfect place for the bees to feel right at home. The Plan Bee team returned to the theme park last weekend to populate the hive and were very impressed with the effort Amazonia has made in creating such an amazing space for the bees. With planted wild flowers around the beehive and educational signs the new hive will help adults and kids alike understand just how much bees do for us and how they make honey. All that’s left now is to buzz off and let the bees get to work! Bee-keeping has been practised in Kenya for centuries now in the savannah, mountain and coastal regions. Using both Langstroth and Kenya Top Bar hives (originally developed in Canada) we can now estimate that there are almost 2 million beehives in the country thanks to the techniques of generations of bee-keepers. 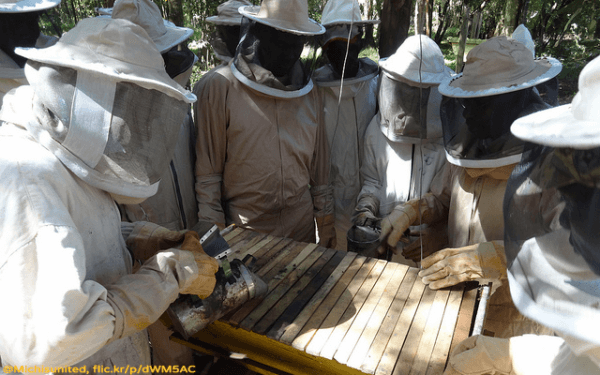 Despite being more fragile than its Canadian counterpart, the Kenya Top Bar hive is extremely popular with small farmers in developing countries due to it being cheap and easy to build. 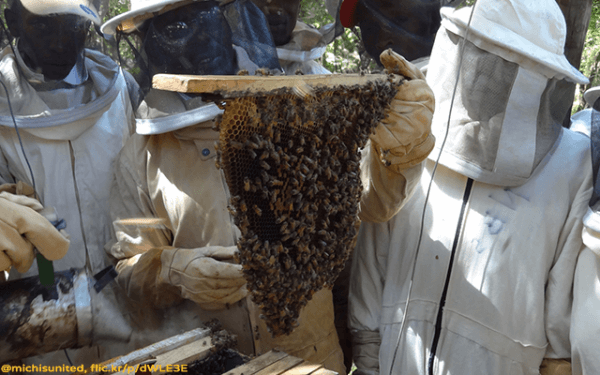 As you can see from the picture below, there are no wooden frames surrounding the Kenya Top Bar Hive comb causing it to be more fragile than in standard hives. Thank you very much Rembrant and Nina for sending these pictures! 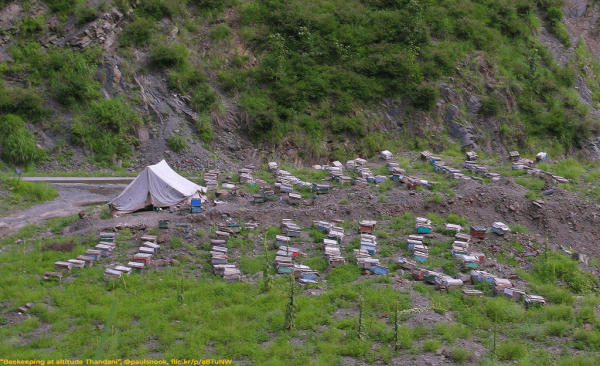 During the Commonwealth Games we have been showcasing various forms of bee-keeping from the countries participating in this thrilling Glasgow event and today we want to show you some beehives from Pakistan! Bee-keeping was introduced in Pakistan during the 20th century and has seen huge developments since the 80s in local production and international exportation. 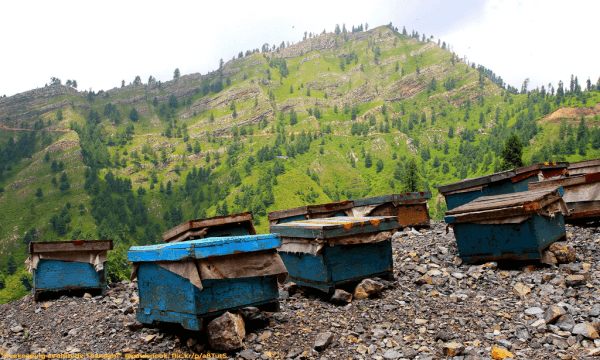 Not only is honey and related produce a huge source of revenue for the country but Pakistan’s bee-keeping is now also helping farmers deal with unreliable crop harvest, irregular rainfall and drought through the exportation of bee products. The bee-keeping industry in Pakistan also provides work for many women in the Middle Eastern country, offering multiple training and job opportunities proving that the severe employment discrimination previously suffered by women is steadily improving. Thank you very much Paul Snook for sending us these beautiful pictures!